The initial results may not surprise you–young adults living in New York City tend to set up shop in North Brooklyn, the Far West Side, the Upper East Side, the East Village and western Queens. This data is courtesy of a new mapping project from the University of Waterloo School of Planning in Ontario called Generationed City. Using census and crowd-sourced data, the project compares demographic patterns of millennials (typically defined as those born between 1980 and 2000) to that of older generations like baby boomers. It looks at North American cities with populations over 1 million where it’s commonly accepted that millennials live in central parts of cities. While the largest chunk of NYC-based data is pretty on par with what we already knew, there are some other trends, both within the city and compared with other cities, that are a bit more curious. What’s interesting about the project in New York is that it shows some unexpected pockets of youth, like Bayonne and West New York in New Jersey, parts of the North Bronx, Forest Hills, and Yonkers. 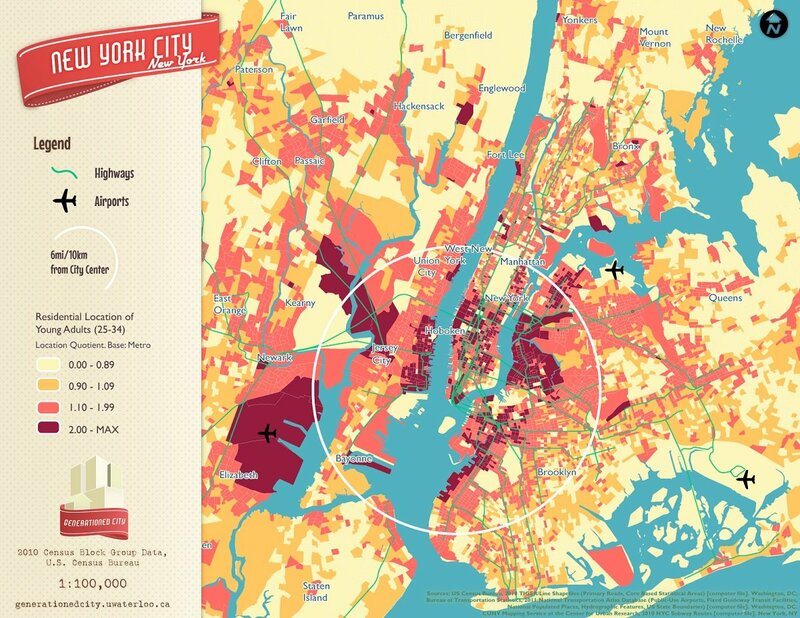 New Yorkers, especially those under 30, tend to think of their city as the center of the world. But according to Generationed City, NYC doesn’t even make the top-ten list of cities with the largest shares of young adults. Salt Lake City, UT and Austin, TX take the top spots. The preliminary results suggest “that the metropolitan areas with the highest shares of young adults are also those where young adults are most centralized, and where the Baby Boomers are more suburbanized.” Though this makes plenty of sense, we’ve also looked at a recent survey that showed that 66% of millennials would rather live in the suburbs, with only 10% choosing to live in a city center.